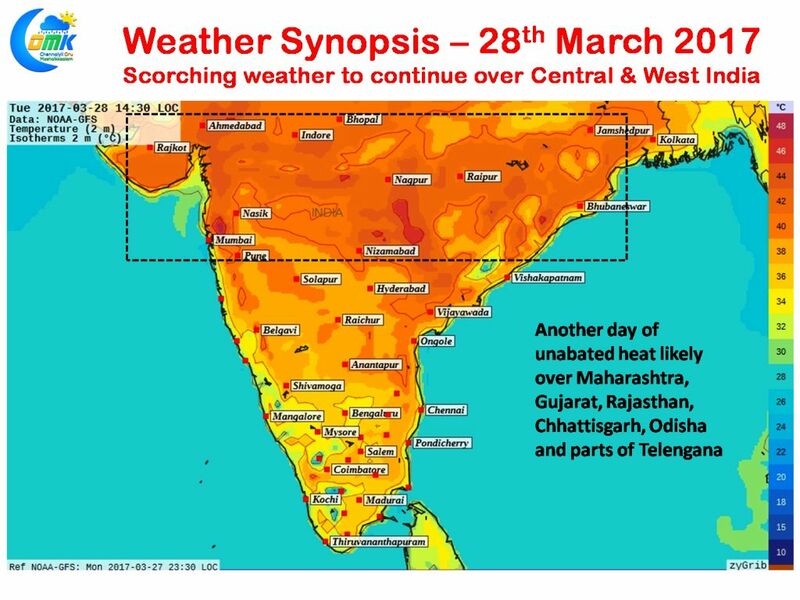 The heat wave conditions prevailing over large parts of India continued yesterday as many places recorded highest temperatures for March. The three hottest places in the country yesterday all recorded their highest ever temperatures for March while Jaisalmer and Nanded also were part of those places setting new records for March. In an indication of how widespread the conditions were spread almost 70 places recorded 40°C or above yesterday. Things are expected to continue in similar fashion for the next couple of days as parts of Uttar Pradesh is also likely to see increase in temperature along with the usual suspects like Maharashtra, Gujarat & Rajasthan. Yesterday saw places close to Mumbai record 42 / 43°C going by models similar scene awaits today as well for places to the W/NW of Mumbai. Even Santa Cruz observatory recorded 38.4°C yesterday and today as well the temperatures could be around these numbers. The Central parts of India around Vidharba, and adjoining parts of Telengana is likely to see another scorching day along with places in Gujarat and adjoining parts of Maharashtra. Models indicate southern areas of Uttar Pradesh to see increase in temperatures today as for the next couple of days more areas are likely to see increase in temperature with places like Delhi touching 41 / 42°C around mid of the week. Comparatively the southern parts of Peninsular India is likely to see moderate heat prevail during the day time particularly places in the coastal areas like Chennai are likely to see closer to normal or slightly below normal max temperature for the next day or two while interior places of Tamil Nadu is likely to see a few places record 38 / 39°C overall though most of TN will see near normal temperatures.